Even when you are away, you can protect your home with a state of the art alarm system. Protecting your home is a number one priority. To ensure intruders do not enter your property, go with a proven protection system. There are many options with this, each beneficial to different homes. We will happily assist you in ensuring you get the right device for your home. Security Alarms Systems consist of: One alarm panel with a ‘push button’ code-pad, or new generation ‘touch screen’, PIR detectors, door contacts, external siren-box with blue (or red) strobe, internal screamer, stand-by battery, remote control for on-off activation connected to home phone line. This enables the panel to dial a pre-programmed phone number which will call either yourself or a monitoring company to warn of intrusion. If no phone-line connection is available, we are able to provide you with a GPRS (General Packet Radio Service) unit which uses a mobile sim-card to dial out. Security Alarm Systems allow you peace of mind, knowing that your premises is secure. 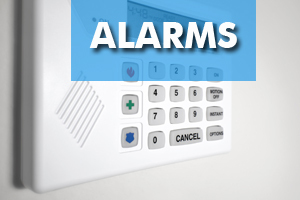 Click here to email us for more information or a free quote on alarms.